Traditionally ingested by the Guarani Amazonian Indians to boost the immune system. Used for treating constipation, fever and gastrointestinal problems, and for boosting sexual desire. Pao Pereira (Brazilian pear) is traditionally used by the Guarani Indians to boost the immune system. The bark contains extremely rare alkaloids (pereirine, flavopereirine, geissospermine and vellosimine) which are very difficult to extract, concentrate and stabilize. Professor Beljanski has conducted the majority of modern studies demonstrating the immuno-stimulant and antiviral properties of these alkaloids, and he has used them as an adjunct treatment for certain cancers. Some of these studies have been validated by the Walter Reed Institute in the USA (the army research institute) and have established (in vitro) the ability of Pao Pereira to block the transcription and replication of the HIV genome, and to do so selectively (without affecting healthy cells). Similarly, according to Professor Beljanski, alkaloids extracted from Pao Pereira have the same toxic effect against certain cancer cells, with no such effect on normal cells. Pao Pereira also inhibits replication of the Herpes simplex virus genome. It crosses the blood-brain barrier easily and attaches itself to potential cancer cells (as shown when given orally to mice). Pao pereira's alkaloids carry a risk of toxicity only in cases of overdose and have no side effects. PP40 can be applied to all types of disease involving immunodeficiency and can be used as a synergistic adjunct therapy alongside chemo and radiotherapy in numerous forms of cancer. The extraction, concentration and stabilization of alkaloids from Pao Pereira is a very complex business. We are practically the only company able to guarantee a stable product, titrated in alkaloids. 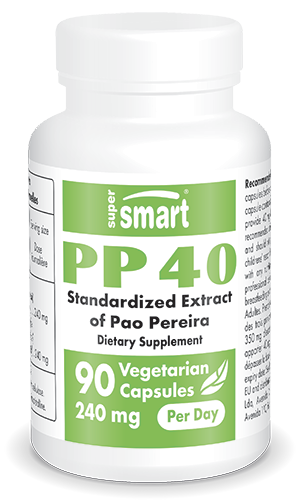 Each vegetarian capsule contains 350 mg Pao Pereira extract. Those suffering from immunodeficiency should take one or two vegetarian capsules before each of their three main meals; higher doses can be used in other cases, in accordance with the advice of your therapist.